For the Black Vulture the overall welcome out there isn’t very spectacular. This particular bird often finds that they aren’t welcome by humans. They are typically seen as a terrible omen in various cultures. The black colors don’t help either as so many people are superstitious about creatures of such a color. As the name indicates they are black in color. It can range from a very light black though to a very dark shade of it. They are completely black other than their legs which are white. They also have a lighter color – almost brown – on the end of their beak and they may have just a hint of white there as well. They have a 5 foot wing span. This species of Vulture lives in the shrubs, and the forests. They are found in the southern United States as well as scattered around in areas of South America. They don’t do well in dense forest regions so in places where the thick forests have been cut away they have found new homes. They also live around areas such as dumps and fish markets due to the availability of food. Due to various changes in climate, it seems like the Black Vulture is moving more North than before. This is an adaptation feature that allows this particular species of bird to continue to thrive regardless of what is going on around them. 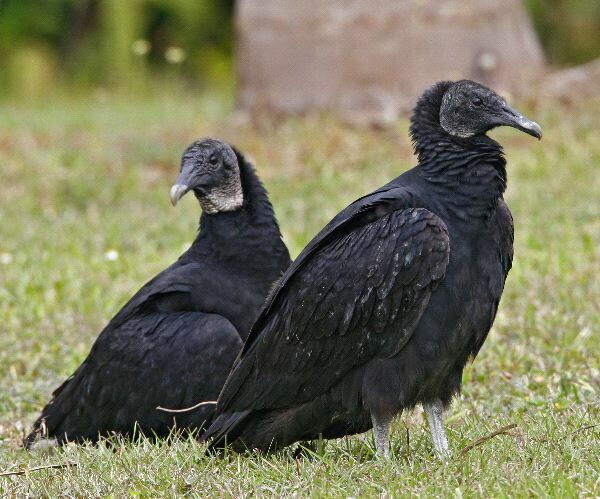 The Black Vulture makes a variety of sounds including squeals and grunts. Their sounds allow them to communicate with each other and to warn off other types of birds. 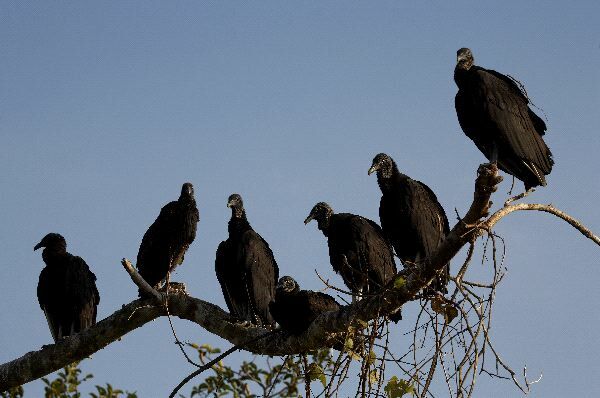 They are the most social of all Vulture groups. It is common to see them in very large flocks. This particular bird is one that is able to thrive just about anywhere. What is very fascinating to experts is that they seem to be doing better in areas where humans have altered the habitat than they do in the untouched forest regions that remain. They consume remains of other kills from animals and will take every opportunity to get food that is out there. They will be able to smell the gasses from the bodies of dead animals and that is what draws them in. They are very aggressive and they often fight with each other when they are feeding, even when they find the remains of a very large kill. They will also consume eggs and even kill the young chicks of various types of birds when they can’t find carrion readily available. They have been known to feed on various remains in the garbage cans of humans in areas where the two habitats are very close to each other. The males will use sound and body displaying to get the attention of a female for mating. They often mate for life so they are very selective about who they will be with. They will remain with each other in a social group even after they have cared for the offspring. The Black Vulture doesn’t build a nest like other birds to place the eggs into. Instead, they place them inside of a cave. They also place them between rocks where they can be well hidden. The female will lay 2 eggs and the pair will take turns watching over them. It can take from 32 to 41 days for them to emerge. They are able to fly on their own when they are about 3 months old. Until that time the parents will bring them back food. As the young mature they will get their own food but they will remain in the social circular for several years before leaving to mate.